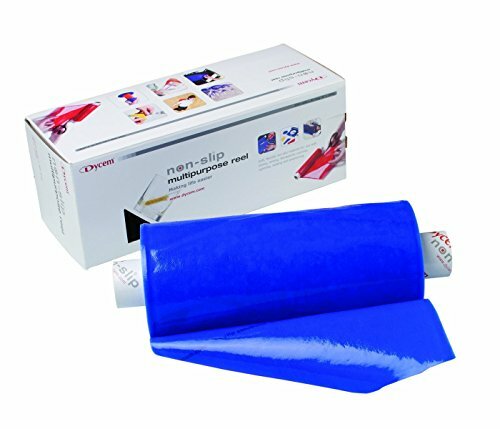 Dycem Non Slip Material Rolls make daily living activities easier by providing an unbeatable grip. Simply cut a section of Dycem material off the roll, then place it wherever you need to add stability to a slippery surface without the need for adhesive. Used and recommended by many occupational therapists, physical therapists and healthcare professionals, the 0.4mm thick material is flexible enough to flex and fit around any object. It has a two sided grip so the material itself will not slip along with items placed on the material. Feel confident living independently by using pieces of Dycem material to perform daily living tasks. At home, Dycem material can be used in the kitchen to hold appliances firmly in place, or used on the table to firmly hold plates and utensils down. Place Dycem material on seats or armrests to stop sliding. In the gym, Dycem material can be used on exercise equipment to provide more stability, or placed on the floor while exercising to add grip. Use the Dycem product at the office to hold keyboards, phones and books in place. A fun colored material can add a pop of color to the work setting. These are just some of the many uses for Dycem material. Dycem material rolls come in 6 different colors. Placing items on top of brightly colored material is great for people with poor eye sight. For example, placing a white bowl on a brightly colored piece of Dycem material, will allow the bowl to be easily seen. Dycem material is non-toxic, latex free and antimicrobial. If the Dycem product becomes dirty, easily wash it in warm soapy water and reuse it once dry. The non-slip properties of the product will be renewed. Dycem material is the ideal non-slip material choice for improving grip, providing support and stability, and enhancing visual cues during everyday activities and exercise.